It looks like it’s going to be a busy week for me. 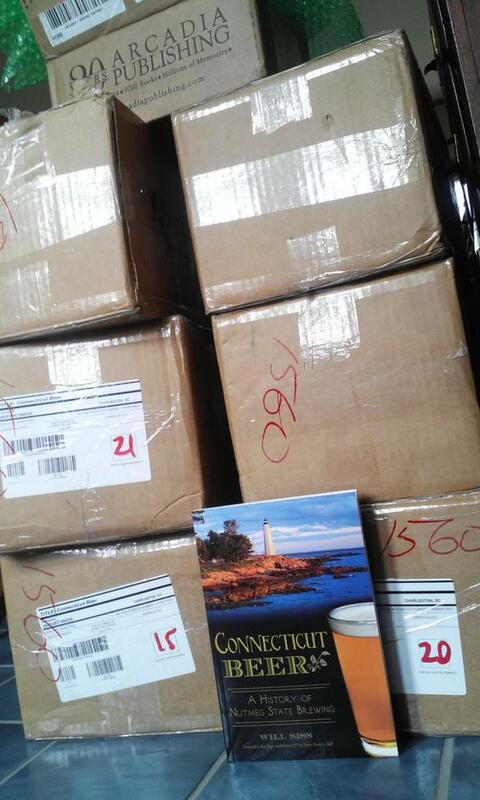 Now that the advance copies of Connecticut Beer (The History Press) have arrived, it’s all so very real that I’ve reached another milestone in this journey. My plan is to lug these puppies all over the state looking for people with the good taste and foresight to purchase them. The next step is promotion, and I’m looking forward to a fun night on Wednesday at City Steam Brewing. At 6 p.m. I’ll be signing books with Ron Page, the brewer there who also wrote the forward to the book. On Friday, I’ll be down in Branford, signing at their first-anniversary party, then on Saturday I’ll be in Wolcott, signing at Shebeen Brewing’s second anniversary party. I’ll be wrapping up the weekend on Sunday at the Thread City Brewfest in Willimantic. Last week I had a chance to talk to Leeanne Griffin, who writes for the Hartford Courant and CT Now; it was a bit weird to be on the other side of the interview, but she’s a pro and I think it went well. Now I get to feel like my subjects do and wait for the story to hit the web and get inked. This entry was posted in Beer Snob and tagged City Steam Brewing, Connecticut Beer, History Press, Overshores Brewing, Shebeen Brewing. Bookmark the permalink.